Lorrie and Rick Crook have found a community through their love of nature. Journal photo by Emily Williams. Moving from the Beaver State to the Cotton State, Lorrie and Rick Crook have found a community through their love of nature. When it came time for the Crooks to retire, they saw it as an opportunity to move from the coastal Oregon city of Newport and be closer to their son and grandchildren in Birmingham. Upon moving to their condo in Hoover, the Crooks learned not only to navigate the change in weather, but to make the most of their free time. “One thing we knew when we retired was that we didn’t want to be just sitting around the house,” Rick said. Though they had visited their son many times, they had never been to Aldridge Gardens. After moving, they stumbled on the facility by chance and fell in love with it. While attending an Art in the Gardens event, the Crooks met garden volunteers and staff, and they stopped on their way out of the park to fill out volunteer applications. Lorrie spends her time working in the gardens’ gift shop or answering phones in the office while Rick helps out in the gardens’ gatehouse. Like many of their fellow Oregonians, the Crooks often took advantage of the many opportunities to spend time in nature – regardless of the ever-rainy weather. “We are both outdoorsy folks,” Lorrie said. She said they hiked, and Rick enjoyed hunting and fishing. Though they consider themselves a far cry from some of the master gardeners they volunteer with, the Crooks have learned a little bit more about foliage of the South through the gardens. Neither claims any particular interest in the science of plants, but they have been trained as docents and they have led a tree program for students. “Lucky for us, they were kindergarten students,” Lorrie said. Having been raised in the Pacific Northwest, the Crooks found the environment in Alabama to be a drastic change. “When we first visited, it was like walking into a different world,” Lorrie said. One of her favorite results of the warmer and sunnier climate is the longer bloom time for some plants. For example, a camellia will bloom in Oregon, but only for a few weeks in spring. Seeing a camellia blooming in winter was a bit of a surprise for her. Rick noted that playing golf on a green that is more of a sand color proved to be a struggle for them. Whether the grass is green or brown, spending a few days each week working at the gardens surrounded by nature has given Lorrie and Rick more of a structure for their free time. Their grandson, on the cusp of his teenage years, may not love it as much as he used to, Lorri said, though he was excited to go to the gardens when the popular Pokemon Go! game came out last summer and drew crowds outside to search for characters. The couple also enjoys attending events the gardens hosts throughout the year, as well as getting a firsthand view of the preparations. Now gearing up for the gardens’ annual Hydrangeas Under the Stars auction, June 10, Lorrie said she is loving the hustle and bustle as auction items and event planners file in and out of the gardens. The sold-out event, taking place from 6 p.m. to 9 p.m., is the premiere fundraiser for Aldridge Gardens and includes dinner, live music and live and silent auctions. Proceeds benefit activities hosted by the garden, which serves the community as a garden, wedding venue, summer camp, field trip destination and bird watching location. In the midst of all of the development in the nearby Riverchase area, the secured green space of the gardens gives people a location to relax or safely take a walk, Lorrie noted. 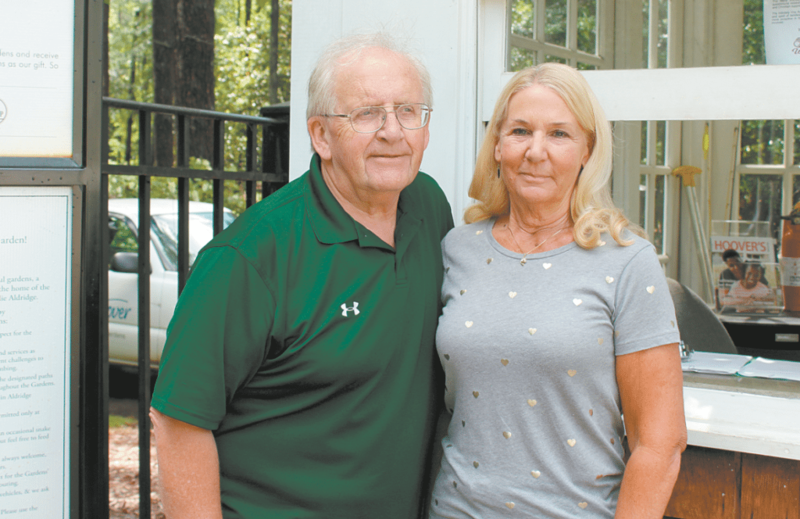 While some might enjoy Aldridge Gardens as a brief escape from the hustle and bustle of a busy work week, the Crooks said they’ve enjoyed volunteering there to escape the potential monotony of retirement.